Every child loves Play-Doh, and every parent gets involved as well! 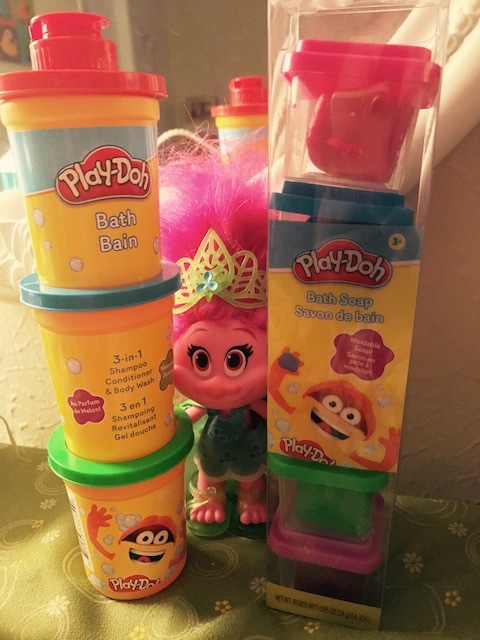 Recently for Christmas our daughter become the happy owner of a Play-Doh Doctor Drill 'n Fill Set and then she was lucky enough to receive the Play-Doh Bath & Body 3-in-1 Body Wash! She was jumping up and down all giddy and then gave some of the biggest smiles ever when she got to open them from the box. Now that is one happy smile, isn't it? Awesome enough, it was also time for a bath so her Daddy got the water filled, and got her in! The first thing we tested out was the Play-Doh bath molding soaps. The soaps have the same scent as the 3-in-1 body wash but it was very fragrant. It was actually a bit stronger than anything we use on our daughter and my husband couldn't continue bathing her. He has a skin condition called Dyshidrosis and the fragrance was causing his hands to itch, so I would suggest that if you help your child bathe make sure not to use this if your child or you have any kind of eczema or skin disorder. But if you don't, then go for it! It was a lot of fun for our daughter! You can see here the color of the soap came off on the skin but it washed right off. Our daughter was molding it and playing with it, and didn't want to stop until it was all gone! It gave her a chance to clean herself instead of us doing it with the loofah, she rubbed her shoulders and upper body with the soaps while it molded to her fingers. Here's another view of the pink soap as she was using it. You can see it definitely foams up and cleans whatever you rub it on. But the fragrance was strong, I smelled it all the way down the hall into our living room since we don't use a lot of fragrant things in our home often. Poppy says hi!! On the left, you can see the 3-in-1 Shampoo, Conditioner and Body Wash we also used. It has the same strong fragrance as the soaps that is pleasant and leaves your child smelling so sweet. We have very soft water in our house so after using this, we still needed to use a conditioner to ensure our daughter's hair stayed soft. Unfortunately, 2-in-1 or 3-in-1's don't work when it comes to soft well water. Your hair gets crunchy even though it's clean; talk about a surprise when we moved to this area! But every time our daughter uses this she comes out smelling so great and feels clean. Her skin shows no signs of any kind of irritation or reaction to the soap which is great this tells us any child can use this but I would test your own skin first to be safe. The little one is so excited to have gotten to try this, and I definitely recommend this for fun bath times with the kiddos! This is also great to use if your child doesn't like washing their hands, the moldable soaps make it fun to play for a few minutes at the sink and the soaps should last several washes if you don't leave them in the tub...which our daughter did. You can find these products at right here in fact you can get the set for $14.49! These make for great birthday and even Christmas presents so stock now!